Content security has risen quickly up the agenda for sports broadcasters. Piracy and revenue security have become major issues for sports broadcasters in the multiscreen era with the emergence of 4K combined with proliferation in online redistribution. This was evident at the annual gathering of sports broadcasters, content owners and technology providers at the Sportel convention in Monaco from October 12th – 15th. The event was attended by just about all the major sports broadcasters including Sky, ESPN, Fox Sports and BT Sport, making it surprising that only a few of the leading content security vendors were present. Irdeto was the only big name from TV revenue security, joined by Friend MTS, which has set up its stall as a specialist in forensic watermarking, which looks likely to play a decisive role in live stream security. Google was also there but in its capacity as owner of YouTube rather than its multiplatform DRM subsidiary Widevine. Nevertheless security did feature more prominently at Sportel than previous years, with Irdeto continuing its campaign promoting digital watermarking as the only viable defence against the growing practice among pirates to expunge broadcast logos and other unique identifiers from live streams before rebroadcasting them, typically over the Internet. At Sportel, Irdeto’s Senior Director for Cyber Services and Investigations Mark Mulready explained how pirates were now employing sophisticated software to remove such identifiers and thereby make it harder both to track where the illegal content has come from and also to take legal action afterwards. Without the markers rights holders may struggle to prove legal ownership of content that was the source of a given pirate stream. Mulready highlighted two ways pirates can remove unique identifiers or logos. Firstly they may take them out locally at a single device, as is most commonly done in pubs or bars where content is shown. Secondly the identifiers can be removed at a “pirate head end” from which content would then be redistributed on a wholesale basis, ultimately reaching large numbers of users. An image taken from a pirated retransmission. The best or indeed only valuable counter to identifier erasure is to embed forensic watermarks into the broadcast content itself. Even in the absence of a logo this ensures unique identification not just of the source broadcaster but also the provenance of each stream instance, which is essential for combating online piracy. It helps identify the actual source of the leak, with the potential then allied to network forensics and other techniques to act quickly against infringing sources. This is essential for live sports because the content value decreases exponentially over the course of the event and has often diminished almost to nothing two or three hours later. Broadcasters and rights owners need to take down pirated streams in near real time within at most about 10 minutes if they are to prevent significant leakage of revenue. According to Irdeto online piracy has proliferated this year, particularly of live sports. Accurate data is by its nature elusive but some sports broadcasters have admitted privately that 30% to 50% of the live streams of their programming being viewed are illegal. A large proportion of these are low quality streams seen by people who would not pay in any case, but that itself is changing, party through the growth 4K content, which can be more readily captured in high quality just by camcording from a big screen. 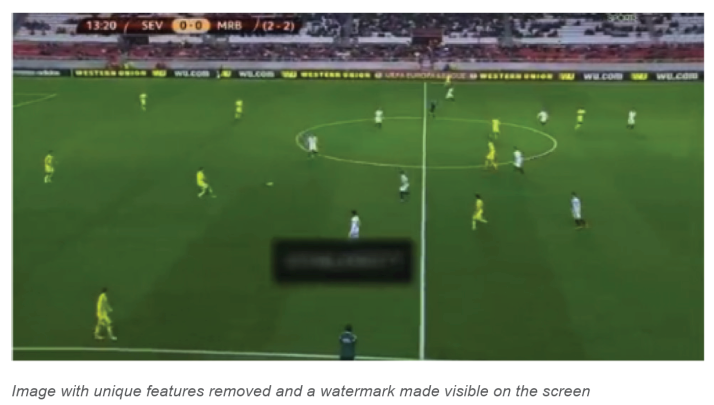 Of course the fact pirates can remove logos suggests they could also attack watermarking systems, but the difference is that the process is then interactive, enabling broadcasters or operators to respond in real time. Watermarking can be adaptive such that any attempt to alter or remove the marks can be detected in real time, enabling the distributor to respond, perhaps by altering the marks or just taking that stream down. It is clear that with the growing availability of premium live sports online the arms race between content owners and pirates has entered a new chapter. The industry may be confident that with forensic watermarking it has a new potent weapon but so far it has yet to make an impact on live stream piracy. Vendors need to put their full weight behind the technology and invest in its ongoing development.